The state Public Health Travel Clinic provides an assessment of what immunizations are needed and then provides the shots. Easy, right? I call. Me: Oh, ok, makes sense, the government needs to cover their costs. So I explain that I’ll be bringing my husband and two kids. Understand these shots will cost mucho dinero anyway so to pile on a $480 for four identical assessments just seems wrong. Aug 17 immunization update: Kroger pharmacies have a travel clinic. In the Seattle area, the Kroger brand is QFC. Yushi Li is one of the two travel clinic specialists in the Seattle area. She met us at our local QFC for the initial consultation and follow up visits for the vaccines. I can’t say enough good things about this service — Yushi was extremely thorough, she came to our neighborhood & the cost was a FRACTION of the other local travel clinic options. Definitely use this resource: http://www.qfc.com/pharmacy/Pages/travel_info.aspx. 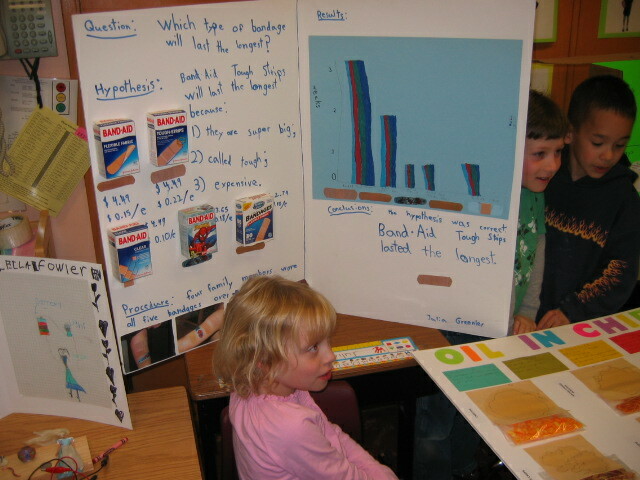 BTW, Julia did her 1st grade science fair project on which band-aid was the best value for the money, so no assessment needed on which to use post-shots…tough strips! ← Siblings: Friends or Foes? Wow! They’re certainly going to get their money, aren’t they? Sounds like you put up a good fight. Too bad you lost.